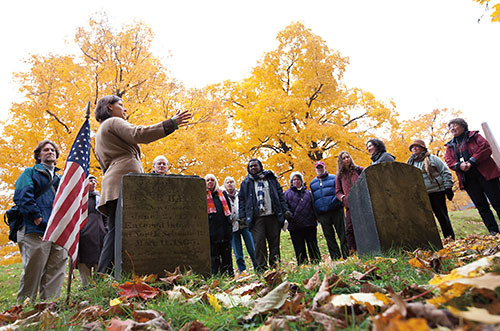 Bates faculty, staff, students, and friends tour nearby Riverside Cemetery during Halloween week, learning College history by visiting graves of early Bates notables, including founder Oren Cheney, famed professor Jonathan Stanton, and leading Lewiston citizen Alonzo Garcelon. Here, the group pauses at the graves of faculty legends Benjamin F. Hayes and Richard C. Stanley. The two died years apart yet they and their families are buried side by side, suggesting (but not proving) a close friendship, explained Kat Stefko, director of the Muskie Archives and Special Collections Library (tan coat, gesturing), who led the tour with archivist Pat Webber. The Muskie Archives celebrates its 25th anniversary in 2010. Photograph by Phyllis Graber Jensen.